A strapping hulk on the heels of adding incredible to his name, Daniel Pierce also known as Eats Everything is at the forefront of a wave of forward thinking house music. From where else but Bristol and his colours fly true, filling a floor on all fours with a lush low end that tips a hat to his past in jungle and UK bass. Not to mention a bouncy fellow and full of wit in person or just English. He's also one half of the sultry house duo Waifs & Strays but who can forget his smashing entrance on the Pets Recordings debute which undoubtedely became one of the biggest tracks of the summer being charted by the likes of Carl Cox, Seth Troxler, and John Digweed and breaking records on BBC's Radio 1. Since then he's been on a streak of pumping out bass-laden bombs with massive breakdowns in "The Size" and a build in "Tric Trac" so obnoxious in riling a crowd up it feels like cheating. 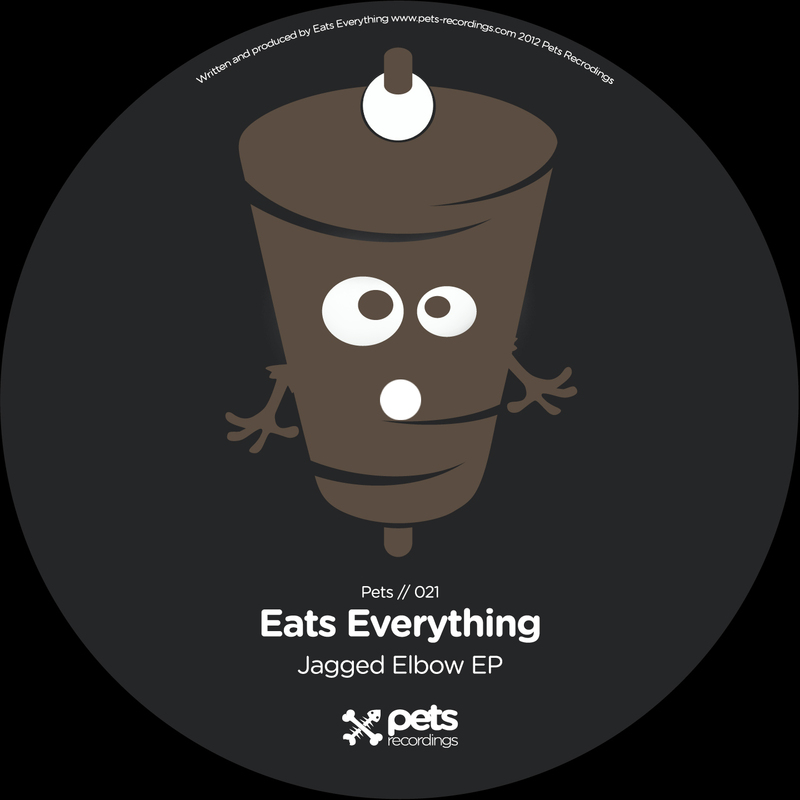 Today marks the release of his second outing on Pets, the label that started it all, and it features two numbers titled Jagged Elbow. The A-side comes paired with a video that seems all too familiar as binging on late night fast food seems to be his forte on the side of eating up the dance charts. It's called "Jagged Edge" and it hits a sinister tone that has yet to be fully explored by the artist, laying down a more weighty bassline while pitched vocals weep and moan over an anxious beat. There's plenty of sounds on top of the mix that the man behind the desk has never done before but the results couldn't be more fitting. A pinchy guitar melody that tips along the stereo field, panning left, right, and center. Which brings me to the wet brassy chords Pierce manages to resurrect from the 90s pump up jams that have become the soundtrack in filling in basketball intermissions. House heads flip to the other side and check out "This Elbow" an upbeat hat swing complete with chord stabs to bob to. All in all the two tracks make for a strong showing that although physically stout, Eats Everything still has ample room to stretch sonically.